Eating healthy, exercising and being a healthy weight are among the behavior changes Americans can make to cut 20 to 40 percent of the five leading causes of US deaths, including cancer, according to a recent report from the Centers from Disease Control and Prevention. For cancer, not smoking or drinking alcohol also play a key role in preventing deaths. The report highlights how the same factors that reduce the risk of cancer also reduce the risk of other diseases. According to the report, the five leading causes of death in the United States are heart disease, cancer, chronic lower respiratory diseases, stroke, and unintentional injuries. The CDC report focused on premature deaths. 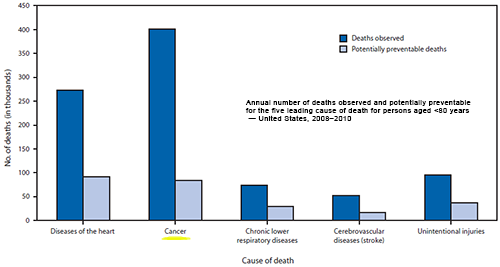 Together, the five leading causes of death accounted for almost two-thirds of all U.S. deaths in 2010. State by state, the report looked at mortality data from 2008-2010 of those who died before age 80. They then used the state with the lowest numbers of deaths as the benchmark to calculate the numbers of deaths from each cause that could be prevented in each state. If all states were to reach the lowest levels for the five leading causes of death, the report calculates, the deaths prevented each year could be: approximately one in three premature heart disease deaths, one in five premature cancer deaths, two out of five chronic lower respiratory disease deaths, one out of every three stroke deaths, and two out of every five unintentional injury deaths. The deaths varied widely by geography, with the Southeast having the highest number of preventable deaths for each of the five leading causes. As the discussion notes, obesity and other risk factors do not occur randomly in a population. They are closely aligned with the social, environmental, economic, and geographic attributes of the neighborhoods in which people live and work.